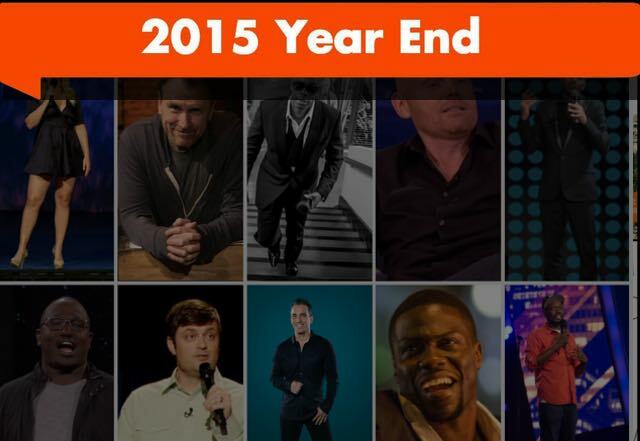 As 2015 comes to a close, we we are celebrating the close of another amazing year in comedy. We’re also celebrating our second year bringing you news of all the greatest comedy happening on and off the internet. It’s time to wrap up the year and put a bow on it, by picking our top ten lists in every comedy category for 2015. And of all the categories, none is nearer and dearer to us than that category of Best Stand Up Comic of 2015. There were gigantic tours- some of the biggest ever, amazing albums, huge specials, and some people who had one of each. Not surprisingly, you’ll see some of the same names that made our 2014 Top Stand Up list, but there’s also a few new additions. Last year Bill Burr was named the 2014 Stand Up Comedian of the Year. Does he have what it takes to repeat? Or will one of the other names on the list steal the title. Vote for your favorite, and come back on January 4, to see who took the prize. Amy Schumer had an unbelievable year, by any measure. The third season of INSIDE AMY SCHUMER won widespread critical acclaim and her first Emmy Award. Her feature film TRAINWRECK was a huge hit that made her a bona fide movie star. She had a one-hour HBO special LIVE AT THE APOLLO that Chris Rock directed. Oh, and she hosted both SNL and the MTV Movie Awards. We’re guessing her 2016 will be pretty good also, when she’ll become the first female comic to headline Madison Square Garden. Hannibal’s star continues to rise as one of the hardest-working comedians. He landed his own series, WHY? WITH HANNIBAL BURESS, which premiered its first season on Comedy Central. He continued his work as the sidekick on THE ERIC ANDRE SHOW and his popular role as Lincoln on BROAD CITY. Hannibal crushed it on the Comedy Central Roast of Justin Bieber. Also, he’s one of the most popular headliners today, selling out venues across the country on his Comedy Camisado tour. Aziz must have fulfilled all of his 2015 resolutions. He kicked off the year by wrapping up his role as Tom Haverford on the final season of NBC’s PARKS & RECREATION. In March, Netflix released his latest stand-up special, LIVE AT MADISON SQUARE GARDEN, where he killed in front of a sold-out crowd. In June, Aziz’s first book, MODERN ROMANCE, went to #1 on the New York Times Bestseller List. And in November, his original Netflix comedy series that he co-created and co-wrote, MASTER OF NONE, premiered to great reviews and earned Aziz a Golden Globe nomination for Best Actor. Not bad. Michael Che has cemented his place on SNL. He co-hosts Weekend Update with Colin Jost, as the two have developed their on-air chemistry in the 40th and 41st seasons. In addition to becoming one of the most recognizable personalities from SNL, he continues to tour as a stand-up. He headlined shows at Montreal’s Just For Laughs Festival and was a part of the Oddball Comedy Festival, with many of the biggest names in comedy. Variety named Nate Bargatze one of their ten comics to watch in 2015. If you watched, you saw he had one heck of a year. He performed twice on THE TONIGHT SHOW WITH JIMMY FALLON, crushing both spots. He had his first one-hour Comedy Central special FULL-TIME MAGIC and released his second album, with the same name. He is one of the most natural, funny storytellers doing stand-up today. He headlined shows at SXSW and Montreal JFL and continues to move to bigger venues as a fast-rising star. Colin Quinn is a living legend. In the past few years, he has found the perfect platform for his voice in his one-man shows, which have been very successful and a great form for his unique voice. In 2015, Colin had a Netflix special released of his previous one-man show, UNCONSTITUTIONAL. He nailed it in his role as Amy Schumer’s father in TRAINWRECK. He released a terrific book, THE COLORING BOOK, which tackles race in America from his hilarious perspective. He also re-teamed with Jerry Seinfeld for his latest one-man show, THE NEW YORK STORY, where he talks about the diversity of New York and his upbringing. Kevin Hart doesn’t seem to have any off-years. He continued to cement his place as an A-list movie star, in films like GET HARD and THE WEDDING RINGER. He killed it roasting Justin Bieber on Comedy Central. He returned to host SNL in their banner 40th season. And he sells tickets like no one else, with his WHAT NOW stand-up tour shattering records for ticket sales. A few months ago, he performed for a stunning 53,000 fans in one show, selling out Lincoln Financial Field in Philadelphia. Dave Chappelle does not need to make many appearances to remind audiences that he’s the best. He made a high-profile return to stand-up on a big stage in 2014 with a run at Radio City Music Hall and continued that momentum in 2015. He sold old ten shows at Montreal Just For Laughs and even made additional appearances at the Festival, doing over an hour each show, to thrilled audiences. He also went on a small theater tour this fall, selling out shows everywhere from New York City to Utah. Chappelle also takes musicians and hip-hop artists on the road with him, as part of his Juke Joint traveling party tour. There were rumors that he filmed a special in 2015 and we all hope we can see it soon. If you ask comedians to name their favorite stand-up today, you’ll probably hear Bill Burr’s name an awful lot. He plays the contrarian better than anyone else. He is a favorite on CONAN, where his hilarious bits about Caitlyn Jenner or politicians, often make Conan and the live audience uncomfortable to our enjoyment. His most recent special, I’M SORRY YOU FEEL THAT WAY, was released in black & white on Netflix and shows Burr at his best. He also has a new Netflix animated series, F IS FOR FAMILY, loosely based on Bill’s childhood and growing up in the ’70s. Sebastian Maniscalco has a devoted fanbase that just keeps growing. Aside from Chappelle, perhaps no comedian at JFL got as much headliner-attention as Sebastian, who headlined multiple sold-out shows. He continues to host the extremely-popular PETE & SEBASTIAN SHOW with fellow comic Pete Correale. He gained attention from his 2015 appearance on Ron Bennington’s UNMASKED on SiriusXM. Sebastian’s last Showtime special, AREN’T YOU EMBARRASSED? earned him appearances on Seth Meyers, Conan, and Fallon. Sebastian also has an upcoming memoir, WHERE YOU WANNA EAT?, as well as a new hour that he will perform at the Beacon Theatre in early 2016.